A group of prominent citizens, including environmentalists, wildlife experts, lawyers, engineers, town planners and architects of Gujarat’s cultural capital, Vadodara, have alleged that the state authorities have begun the work of “developing” the riverfront Vishamitri, which meanders through the city, without any environmental clearance (EC), despite an earlier assurance. Led by well-known environmentalist Rohit Prajapati, a letter signed by them to the Union environment secretary, says that on September 19, 2015, they were “informed” that the riverfront project would not commence before EC, which would be preceded by environmental impact assessment (EIA), social impact assessment (SIA) and environment public hearing (EPH). Others who have signed the letter include advocate Nakul Pradhan, landscape architect Dr Shishir Raval, architect Neha Sarwate, engineer Deepali Gheliani, Wildlife Advisory Board member Smita Pradhan, environmental activists Krishnakant and economist Swati Desai. “The VMC fails to understand the fact that the first step in any effort for the revival of the Vishwamitri River must acknowledge that a river is more than a channel carrying water; it is also a transporter of sediment; it consists of catchments, floodplains, river-bed, adjoining ravines, which along with the vegetation on both sides, is the river’s natural mechanism to retain the additional water, prevent floods and provide habitat for wildlife”, the letter says. 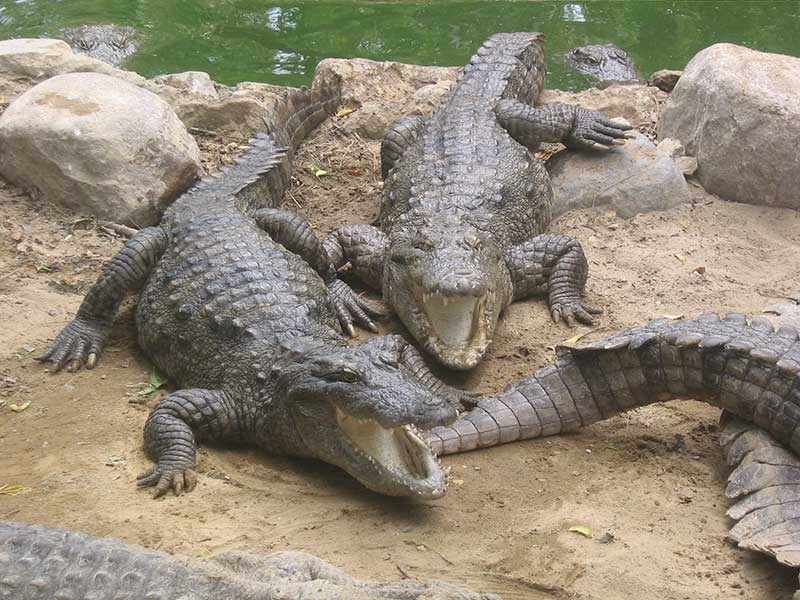 Originating in the historic Pavagadh hills, the river consists of a protected species, the Indian crocodile, which has been “inhabiting and breeding in stretches of the Vishwamitri River for thousands of years”, the letter says. The wildlife proect Act, 1972, stipulates that “injuring or destroying or taking any part of the body or any such animal or in the case of wild birds or reptiles, damaging the eggs or such birds or reptiles, or disturbing the eggs or nests of such birds or reptiles”, the letter says. It contends, “The activities carried out in the name of the Vishwamitri Riverfront Development Project, especially proposed construction activities vis-a-vis JCB dumper, etc., have the potential to destroy the natural ecosystem and habitat (its breeding grounds and nests) of the crocodile and other species." This, according to the letter, is happening in complete disregard of the fact that “much drummed up flood stories from Vadodara are also actually less about natural floods and more about human follies and official negligence”, allowing natural water bodies to be used as “dumping grounds”. In eight instances over the last 21 years, Vishwamitri’s level at Kala Ghoda bridge gauging station showed its level above 26’ – the flood alert level. “Further”, the letter says, in order to begin the project more than 5,000 people have been displaced, and many more are expected to be displaced. These include slums in Sama (Sanjay Nagar 1&2), Indiranagar, Manjalpur (Bajaniyavaas), Chhani (Soniyanagar), Jamwadi (Sayajiganj), Sainathnagar (Danteshwar), and Fatehganj (Kalyan Nagar). We are concerned for our loot of Public money only in all VMCC Vadodara projects.In 2008 Mr. Balkrishna Sukla, the thn BJP Mayor visited London with two VMC officer to see Tom River of London to make the Vishwa Mitri same as of London. Only 500 crocodiles are there they will be catches by our Fire department officers and leave them to Ajwa reservoir. WE are Concerned only how to lot public money for self and for BJP Party funds as well as to send money to Nagpur to please our RSS parent organisation. Mr. G.R.Aloria IAS, Principal Secretary, UD &UH deptt. Govt. of Gujarat. And others as given in e-mail. Please read my attached letter dated 14.06.2013 on Rehabilitation of Slums of Gujarat. In 2008 Vishwamitri River front development of Rs 300 crores from JnNURM fund was prepared. In first phase Slums are to be removed. As on to day 4500 slum Dwellers are only on the banks of Vishwamitri River. No land available to remove /shift them from River banks. Secondly the Vishwamitri River is a Gutter Ganga. Impossible to stop sewage to be drained in the River. How the Vishwamitri River will be developed like Sabarmati River front project? Please study 40 slide prepared by VMSS on 1st September, 2008 of Vishwamitri River.All money gone waste to clean Vishwamitri River in 2008-2009. Resulting converting Vadodara into Mosquitoes City due to breeding of mosquitoes in river water mixed with sewage.